The objective of this research is to collect structural performance data (strains, accelerations, etc.) and environmental data (wind speed, direction, etc.) 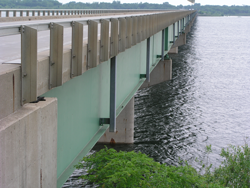 on the Saylorville Reservoir Bridge near Polk City, Iowa for the purpose of developing a self-contained/reporting safety information management system to alert bridge engineers, and more importantly, the public, of high wind events and direct/divert traffic to an alternate route should conditions for bridge passage be unsafe based on the collected data.